In the Fylde, Lancashire, Cuadrilla still does not understand the geology at its wellsites, even after nine years of active exploration. 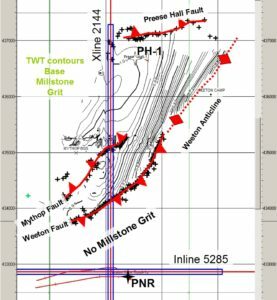 Its geological interpretation of the pre-Permian at Preston New Road (PNR) has changed significantly between early 2015 and now. Some of the interpretations do not make structural sense, so are untenable even on their own internal evidence. A major error in the prior interpretations was discovered by the absence of the prognosed 300 m of Millstone Grit at PNR-1, completed on 11 January 2018. 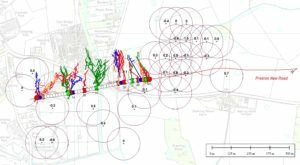 My ongoing interpretation of the 3D Bowland-12 seismic survey confirms that Cuadrilla’s current interpretations are untenable. Preliminary contour map of the base of the Millstone Grit. It is absent around PNR because of the reverse Weeton Fault, unrecognised by Cuadrilla. Click to enlarge. Major faults cutting the entire section, including the post-Hercynian Permian and Triassic sediments, have been omitted from Cuadrilla’s example cross-sections. I submitted a report on these findings to the Environment Agency in mid November, asking the agency (via my lawyer) not to approve the hydraulic fracture plan (HFP) for PNR-2 until Cuadrilla had carried out a complete overhaul of its interpretation. There has been no word back yet about the EA’s decision on a new HFP; but if a permit is eventually granted on unsatisfactory grounds I shall be challenging the EA in court. 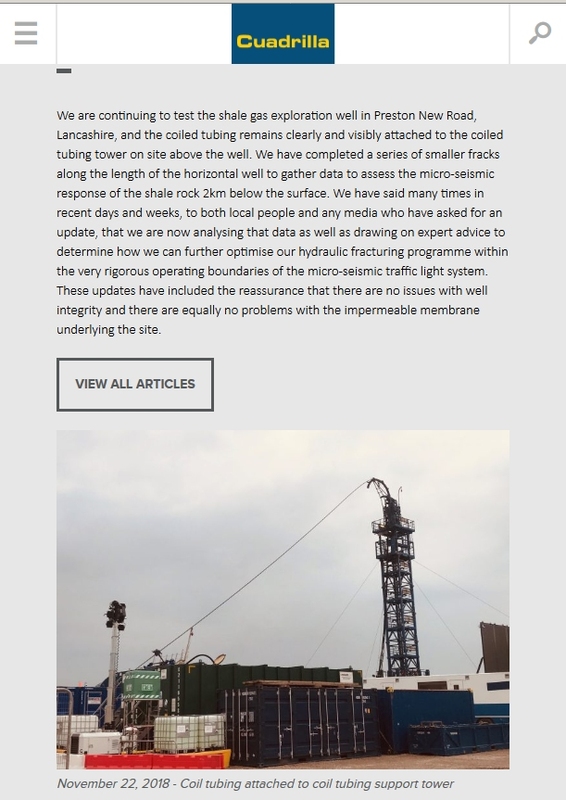 However, this blog is about yet another Cuadrilla technical fiasco, during fracking of the horizontal well PNR-1z between mid-October and mid-December 2018. The company described its initial flow tests as “highly encouraging“, but in early February it admitted that it had only fracked some 5% of the target 41 stages. Cuadrilla blames its woeful performance on the restrictions of the Traffic Light System (TLS) for monitoring induced earthquakes. Here I show that this excuse is more or less irrelevant; natural tectonic stress plus technical incompetence are the real sources of Cuadrilla’s failure to frack the well successfully. The source of the information presented below is the daily reports submitted by Cuadrilla to the OGA, released in mid March 2018 under an FOI request. I have combined them into a single pdf and put it online for convenience. Drill or Drop pointed out in November that Cuadrilla was supposed to make these daily reports publicly available, but the company refused. Read on and you will understand why! The map below shows PNR-1z (red line) running west from the site. The horizontal part of the well is at around 2300 m depth. There are 41 frack stages, running from 1 in the west (red circle) to 41 in the east (red circle). Differing colours are used merely to differentiate adjacent stages. Those which have not been fracked are shown in white. The fracks for each stage, shown as zig-zag lines matching the colour of the stage, generally run to the north, although some run to the north-east. The depths are mostly somewhat below the wellbore level. Fracks (multicoloured lines) on PNR-1z. Induced earthquake locations shown by dots annotated with local magnitude; circles indicate approximate location error. Click to enlarge. Normally fracks run equally in both directions from the wellbore, aligned along the minimum horizontal stress component. Here this direction is north-south (which is why the well was drilled east-west in the first place). But PNR-1z is highly unusual in that there are only northward-running fracks. The fracking is carried out using coiled tubing and sliding sleeves. The former is flexible, and can be inserted and withdrawn as needed. The latter comprises a set of sleeves, one for each stage, which can be opened and shut in turn to permit the hydraulic fluid to escape at the desired stage. This new technique has largely replaced the method of plugging off the casing (steel well pipe) on either side of a stage then blasting a hole through the casing with a small explosive. To the best of my knowledge there is no sleeve mechanism for directing the fracking; furthermore, there would be no reason for Cuadrilla to want to do so. The ‘classic’ frack shape is like a pair of vertically aligned butterfly wings spreading either side of the wellbore; in the present case this would be one wing to the north and one to the south. Why is the southerly wing absent? If there is a horizontal tectonic stress gradient, decreasing northwards, it would bias the fracks to be directed northwards and not southwards. If correct, this is a natural phenomenon about which Cuadrilla can do little. In contrast, technical incompetence is something for which Cuadrilla is totally responsible. We already know about the company’s 100% record of technical failure at its other Lancashire sites. PNR-1z now adds to this list, and thus maintains its 100% failure record intact. The incompetence, to which Cuadrilla has never admitted publicly, explains why the company suddenly went quiet in November. Here are the details. Cuadrilla began fracking on 15 October 2018 with a minifrack of stage 1, furthest from the wellpad. Fracking proceeded eastwards to stage 40, but with many gaps, until 2 November. A problem then arose the following day, when sleeves 30 and 31 could not be closed. The coiled tubing was withdrawn and the well was cleaned, ready for a cement job to seal off the two open stages. Eventually by 17 November the two stages were cemented; then the bore had to be milled out through to stage 1 at the far end. All this sounds bad enough – but then Cuadrilla dropped off some components of the working string in the well: the milling tool, a crossover unit, and part of a motor drive assembly. So a ‘bullnose’ bottom hole assembly was then fitted to the end of the coiled tubing, and the orphaned gear was pushed by the round end of the bullnose past stage 1 to the end of the wellbore, there to remain for all eternity. This takes us to 27 November. The well then had to be cleaned, with the help of nitrogen lifts. Cuadrilla press release 22 November 2018: no mention of 3 weeks of severe technical problems. Click to enlarge. Cuadrilla’s press release during the month of problems is highly misleading (see image). There is no mention of the cement job to seal off the open sleeves, which had been ongoing for three weeks. At the time of the press release the now-hardened cement was being milled out. On 8 December fracking re-started, with full fracks of stages 37-41. The company was now injecting slickwater + hydrochloric acid, and not just ‘pure’ slickwater as previously. Work stopped on 17 December. In the popular imagination slurry usually brings to mind farmyard slurry – a suspension of animal manure in water, to be sprayed on fields. In the world of fracking it refers to the sand proppant carried along in water, possibly with some other additives; however I think the farmyard imagery is appropriate for Cuadrilla. It is crucial that the slurry being injected during fracking runs at a fast and preferably constant rate, otherwise problems like clogging of the pores and fractures near the wellbore may occur. So the rate at which slurry is injected is kept constant by varying the pump pressure as necessary. During the PNR-1z fracking the slurry volume never exceeded 4.2 cu.m/min, with corresponding pump pressures of 400-500 bar. These correspond to about 26 barrels/min and 6000-7000 psi in US units. This flow volume is only about one-half or one-third of the usual rate, and the hydraulic pressure is also somewhat low. 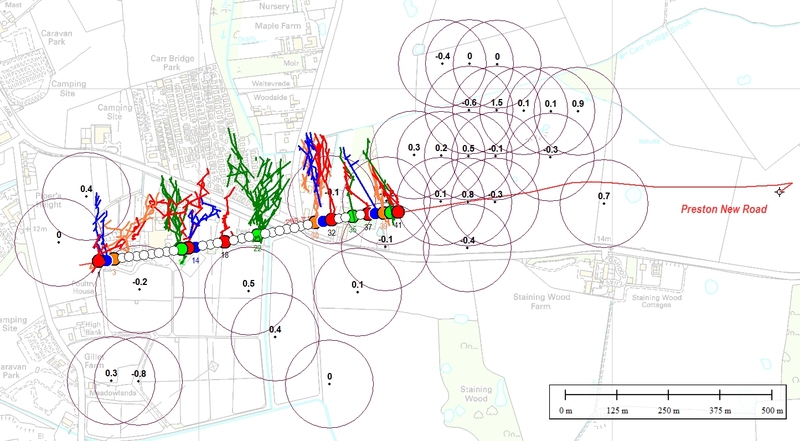 There is no evidence from the injection graphs in the daily reports that Cuadrilla tried, even temporarily, a higher slurry flow rate and/or applied a significantly higher hydraulic pressure. I find this surprising. Perhaps the company simply didn’t have enough pump horsepower on site. The map above shows the locations of the induced earthquakes. The locations are only given to a precision of 0.001 deg in latitude and longitude; this is about 110 m in latitude and about half that in longitude. That is why the dots line up on a grid. I have indicated a very approximate possible circle of location error, based on that precision, but it does not preclude a greater location error. Notwithstanding the likely location errors, it is clear that the seismicity is not at the frack zones, but around it and especially concentrated in the north-east. Such a separation of the visible injection zone, as shown by the fracks, from the induced earthquake trigger points is normal. What this implies is either that the stress regime was altered sufficiently by the fracking to trigger slip on a fault (i.e. 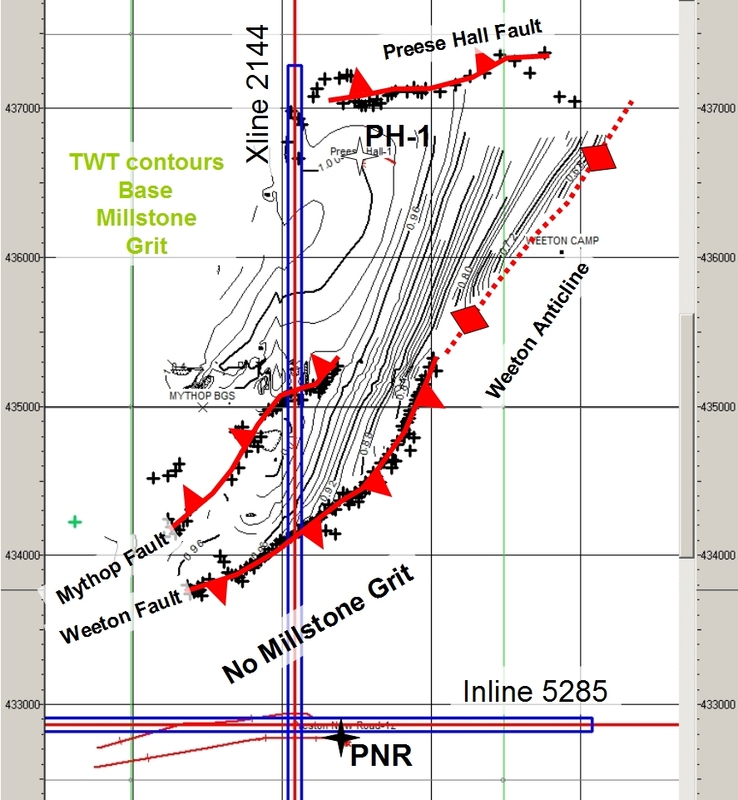 an earthquake) and/or that the frack fluid passed by stealth (yes, that’s the correct technical word) from the microseismically mapped fracks along a fault zone, which then slipped at a point further away once a sufficiently large surface of the fault had been lubricated by the frack fluid. 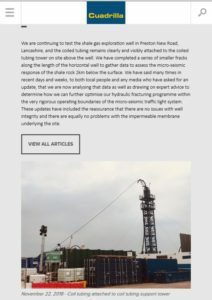 Cuadrilla and Ineos have recently complained that the Traffic Light System (TLS) of monitoring for induced seismicity is seriously interfering with progress in fracking. But the evidence to date from PNR-1z hardly supports such a view. Cuadrilla needs to explain in a lot more detail how much hydraulic horsepower it had available at the site and why, if sufficient, it did not use it. It is also clear that in 70 days of fracking, only about 5 days (maximum) were ‘lost’ due to the delays required by exceeding the Ml = 0.5 (red light) limit on earthquake triggering. In contrast 35 days (3 November to 7 December inclusive) were lost due to Cuadrilla’s technical incompetence – precisely over 50% of the 70 64 days spent on the site. I think that it is a bit rich for Cuadrilla to blame the TLS. In conclusion, Cuadrilla is simply not up to the job, and, eight years on, continues to be be mendacious about its activities. I am Emeritus Professor of Geophysics in the University of Glasgow (a courtesy title). I retired from the University in 1998 and live in France, where I continue my research in geology and geophysics. Very interesting. I sit on the Community Liaison Group for PNR. They informed us at the last CLG that the HFP for PNR 2 has been withdrawn and is expected to be resubmitted after some new data has been analysed. This also coincides with the application to vary the environmental permit. Amazing work highlighting the nature of PNR, the ignorance of the industry and the cover up that the industry puts in place to the gullible powers that regulate them. Well done David, thank you. Thankyou so much for this very detailed report, Professor Smythe. Your clear exposition made it( almost) intelligible to a lay person like me. We always suspected Cuadrilla of near criminal incompetence and a cavalier approach to data interpretation and your work confirms our suspicions. I expect the government, when it first decided on wholesale endorsement of fracking, had no idea that the”ordinary people” who would oppose it had so many experts, professionals, scientists, lawyers etc. in their number. As someone with no particular relevant expertise I limit myself to general campaigning and being a nuisance at PNR and it is wonderful to have experts such as yourself to complement our efforts. Many thanks. Another excellent report from Professor Smythe. Author, FRACKED! OR PLEASE DON’T USE THE F-WORD. Thanks Alistair – I am approving the comment even though it sounds suspiciously like a plug for your play! It is a real pity that the play (starring Anne Reid and James Bowlam) never made it to the ‘desolate north’, as the former Guildford MP Lord Howell described the region north of the Wash-Bristol line. Thankyou so much, excellent insight. Does the lack of full honest disclosure in cuadrilla’s press/reporting not count as fraud against investors?